Almas Jiwani pins down critical issues facing women at the 2nd International Women and Justice Peace Summit Jointly hosted by prominent non-governmental organization Women and Democracy Association (KADEM) and the Ministry of Family and Social Policies, the event on Nov. 25-26 has the theme "Speak Up for Justice!" coincided on the International Day for the Elimination of Violence Against Women. 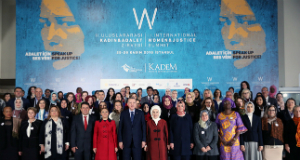 Turkish President Recep Tayyip Erdogan and Fatma Betul Sayan Kaya, Minister of Family & Social Policies attended the opening ceremony of the event. The two day summit which saw its inception last year, was characterized by a series of invigorating panel sessions centering on a plethora of pertinent challenges facing women worldwide. Predominant among the themes that were discussed were the Syrian Refugee Women and their problems, women in their working life and the opportunities available to them, as well as Cultural Codes and Masculinity. 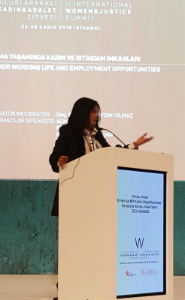 President and CEO of the Almas Jiwani Foundation (AJF), Almas Jiwani delivered a momentous speech pertaining to opportunities for women in the work place as she made a convincing case for employment being the single most important factor for a progressive society. She maintained that various studies support the fact that gainfully employed people tend to be more economically stable and therefore, more psychologically balanced than their counterparts in a contrary situation. She noted that employment went a long way towards reducing overall aggression in society while reiterating AJF's commitment to equip women and girls with the requisite skills to that effect. She expressed her overall optimism about the future of women in general and attributed her optimism to the object of the summit which was women and justice. She further asserted that "At long last human thought has progressed enough to consider combining these two forces (women and justice) and if this combination is allowed to flourish, only one outcome is possible - success in the realization of global peace." "We believe that Ms. Jiwani is one of the most influential and effective advocate for the advancement of women's rights in social, economic and political spheres throughout the world. Known for a powerful, innovative vocal for the women's empowerment both in Canada and abroad, Almas Jiwani was appointed as good will Ambassador of the World NGO and over the course of her humanitarian endeavors, Almas Jiwani has been recognized with numerous accolades, national and international awards. Drawing from her professional and personal experience as a world traveler and champion of women's rights and empowerment, Almas Jiwani will be a featured speaker on the multifaceted challenges, injustices facing 'Women in their Working Life and Employment Opportunities' and will be sharing her unique perspective with regards to social justice for women and their role in bringing about world peace," said Prof. E. Sare Aydin YILMAZ, President of Women and Democracy Association, Assoc. Providing a favorable background on which women of Turkey can utilize their knowledge and abilities in contribution to the development of the existing political, social and economic systems in this country. Contributing to the development and strengthening of democracy, the rule of law, and respect to human rights and fundamental freedoms through protection of women's rights.